The changes in my friendships took me a little off guard when I began this journey of homeschooling. I told a friend that as I wrote this post I thought it could honestly be a book, a book I don't have time to write, but a book none the less. Your journey will look different than mine, but I will share some of the changes I have seen along this road. Parenting Intimacy levels change when you choose a completely different parenting lifestyle. You will not be able to talk about PTA schedules together or discuss your kid's teachers. You can't moan over E-learning/Snow Days together. You won't understand the morning struggle of getting four kids ready to get on a bus. You will feel left out of these conversations. Your public school friends may also feel left out of your life too. They won't understand the mind numbing struggle of choosing a curriculum. They don't get the worry of making sure you are following state laws when you begin, the stress of finding a co-op, or figuring how to organize all your homeschool subjects. I know that when I share my parenting issues with homeschool moms, their reaction will not be "all those problems would be solved if you just put your kid in public school". 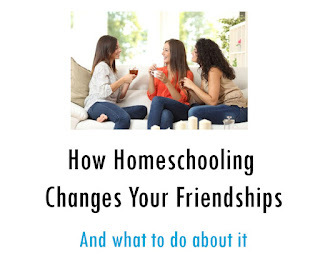 Yes, homeschool is not for everyone, but if you deeply believe God has called your family to this lifestyle, you need to have friends who encourage you in that goal. There are parenting struggles that are universal, and it is ESSENTIAL to find common ground to maintain your friendship. But to maintain an intimate friendship, you will need to connect deeper on subjects that don't necessarily involved your kids. PARENTING IS NOT THE ONLY THING ABOUT US LADIES. We are mothers, but we are also wives, friends, daughters, and women. One of my best friends in the world moved to a different state last year and the last time she came to visit me, we talked for about 4 hours without stopping except to eat, and even then we talked while eating. We MAYBE spent 10 minutes of that time talking about our kids. She is a public school mom. She supports me, and I support her, but we just don't have all the same parenting experiences in common. We connect on so many other levels that it is OK that we don't share school experiences. I can't go to a playdate at 10 a.m. on a Monday, or attend a morning Bible Study. I can't meet for coffee after school drop off. After summer, Back to School season is a another huge marker of our friendships changing because our schedules change drastically. Most of my public school friends understand this and still love me, but it does mean that I missed out on get-togethers of my mom friends a lot. Sometimes it can hurt to see everybody getting together when you know you can't join. It can either breed doubt in your choice, or bitterness at your friends. It is essential to recognize these feelings before that take root and lead to hasty decisions or more hurt. This is the schedule of the life that God has called me to, and I believe that the sacrifices are worth it. Sometimes people ask me how my homeschooled kids make friends. I always respond, "The same way all adults do, they have to be intentional about making plans." Sometimes homeschooling means getting creative with your schedule. I invited a friend over tomorrow and she's going to bring her preschool-age children to play with our stash of old preschool toys while my older kids can do their independent school work and us Moms chat. Sometimes it means blowing off school and making a friend connection a priority that day. And sometimes it means that a relationship drifts out of your life because that person can't accommodate your lifestyle. It's important that you surround yourself with people who encourage you in your goals, and if your goal is to homeschool then real friends will understand. Parenting is one of the most personal things you will ever do. It is natural to see a friend's different parenting choice as a condemnation against our choice. 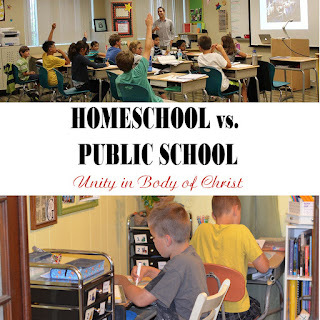 It is so natural to mistakenly hear "I home school" as "I think public school is wrong", or vice versa. Please note that there is a difference between 'defending' and 'defensive'. Defending is standing up for, or justifying a worthwhile cause. Defensive is anticipating an attack, even before it comes. Defensiveness is taking everything personal, like the above mentioned differences in schedules and experiences. Many things are very worth defending, but a quick jump to defensiveness can really hurt your friendships. Honestly, I have no perfect answer for this because you can ONLY CONTROL DEFENSIVENESS ON YOUR SIDE. In my case, I deal with my defensiveness by addressing my insecurity and setting boundaries. Security- I think we fight defensiveness by security in our decision. 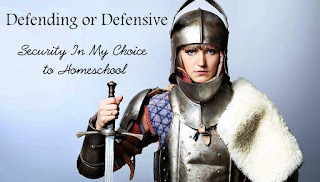 Read books about homeschooling, read articles, and pray about why you homeschool. But this it is up to you. If your friends choice to public school makes you defensive, that is on you to seek wisdom and healing in whatever if making you insecure. Surround yourself with moms who have done this before and ask them questions on how they dealt with their insecurity. We ALL have it, you are not alone. I myself learned this lesson through my own deep insecurities that kept me from friendships with homeschool and public school moms alike. If your insecurity is keeping you from intimacy with women, then it needs healing. Boundaries & Expectations. It is OK to not talk about EVERYTHING in your life with EVERY FRIEND. Healthy filters , a.k.a. boundaries, are just realistic expectations of others. My husband ,and about two other women, are my only friends with whom I have almost no filters. Even then I don't talk about some women issues with my husband, not because he'll judge me, but because he won't be able to help me the way I need. It would be an unfair expectation to put him the position to fill all my needs. I am not advocating inauthentic conversation, but having realistic expectations of other humans. It us unfair for a public school mom to expect me to vent with them over parenting choices I don't share, or just don't understand because I haven't experienced them, and vice versa. All parents have the SAME GOAL, but we walk different roads to accomplish that goal. We can talk about the goals together, but be aware of how you talk about the roads you take to reach that goal. I need these types of boundaries on many topics, not just homeschooling. I have loved ones with whom I can discuss politics, and some the topic is off limits if we want to preserve our relationship. I have friends who have food allergies like me, so I know I can vent to to them. Boundaries help me keep amazing and wise people in my life, who happen to disagree with me on a few non-essential subjects. If we define ourselves completely by parenting choices, and make it a deal breaker in relationships, you will miss out on many amazing people who can give wisdom on other topics. We need other women, and division over school choice is the last thing that should tear us apart. Please see the other articles below on how we can have more unity as women. I truly hope this helps a homeschool mom out there!